If you've not been keeping-up with the Microsoft blogs lately, there's a good chance you have missed some pretty cool releases from the folks up in Redmond. Microsoft's been busy releasing betas and CTPs and altogether new tools for developers, and primarily web developers at that. In typical "Microsoft of today" fashion, all of these releases are free, and most of them are available with source code on CodePlex. ASP.NET MVC 2 Preview 2 - The second update to the ASP.NET MVC v2 project is now available. Preview 2 adds support for things like "Areas," model validation providers, and client-side input validation. Phil does a better job elaborating. If you're an ASP.NET MVC convert (or fan) and you want to get your hands on the latest and greatest, the source is now available (as usual) on CodePlex. ASP.NET MVC 2 Upgrade Tool - Just squeezing-in before the bell for this blog post, Microsofty Eilon Lipton has also just released a simple tool that helps you upgrade ASP.NET MVC 1 projects to ASP.NET MVC 2. Simple tool, but helpful perhaps for any of you ready to upgrade your MVC 1 sites to a preview framework...Download from his blog. Ajax Control Toolkit - Do you use the Microsoft Ajax Control Toolkit? If so, you might want to check out their latest release (published earlier this month). It contains a few new controls- SeaDragon control (for Deep Zoom images) and AsyncFileUpload- and a lot of bug fixes. The controls and the source are...everyone now...available for download on CodePlex. Visual Studio 2010 Beta 2 - Last but certainly not least (and just publicly revealed), Microsoft is finally releasing a broad, public beta of Visual Studio 2010. Beta 2 will be broadly available tomorrow (Wednesday) and it will be your chance to start playing with all of the goodies in .NET 4.0. VS 2010 also sports a pretty nice visual makeover (new logo below), so unlike the upgrade experiences from VS.NET to VS 2008 ("Okay...looks...the same..."), you'll instantly notice that VS 2k10 is a major upgrade. Details on Hanselman's blog. Download from Microsoft. And I think that's all for October. I could be wrong. Microsoft is updating at a furious pace as we head towards PDC, so it is tough to keep-up. At the very least, this is a great collection of updates any ASP.NET developer should check-out. Grab the updates from Microsoft and try them out this week...because in a few weeks, you'll have lots of new Telerik code to play with! While I may be busy galloping around the world speaking at different events this fall, that hasn't slowed down the Telerik dev teams from marching forward with Q3 2009. The third and final major release of the year is rapidly approaching and that means that now is your last chance to download some Q3 betas and start previewing for yourself what the new release will deliver. Both of these suites are shipping new controls in Q3, and both are pushing hard to maximize performance on their platforms. For example, all of the RadControls for ASP.NET AJAX will be getting a performance boost in Q3 (about 30%) because our dev team has refactored out almost all reflection-based code in the source. The RadControls for Silverlight, meanwhile, will also be getting a boost due to radically revamped UI virtualization techniques in controls like RadGridView. I will post more details on each suite later this week as I spend more time previewing the upcoming Q3 bits, but for now, grab the betas and share your feedback. This is your chance to let us know what we should tweak before the bits are "official," so download the betas and share your thoughts in the forums! Hello from Bulgaria! This update comes to you direct from Telerik HQ in cold, wet Sofia, Bulgaria. I am seated high atop the Telerik building listening to the sounds of buses and cars cruise by on the wet streets below as I get prepared for a busy week with the local teams, and I figured it was high-time I broke my blog "travel silence" to bring you a quick update. 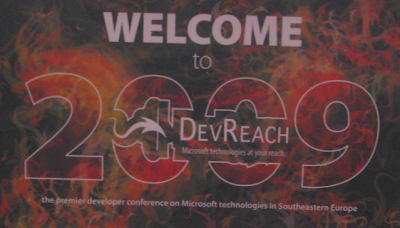 As you know, I am in the middle of the busy "fall travel season," and since I'm in Bulgaria, that means it's time for DevReach 2009. The conference went down last week and it was a great event! Despite the economic turmoil plaguing many events this year, DevReach was as strong as ever, with over 450 attendees packing the two days of sessions delivered by "first class" speakers. Everyone from Richard Campbell to Shawn Wildermuth to Tim Huckaby, Chris Sells, and Kent Alstead (and many others) trekked to the capital of Bulgaria to put on a good show. All of the sessions were well attended and everyone seemed to have a "good enough" time. The most popular session this year (of mine)? Probably "Will It Blend." A big thanks to everyone that came-out to my sessions and for putting-up with my random Texas trivia. Hopefully you all had a good time and managed to learn something (even if only how great Texas is) at each of my sessions. I captured some video from around the conference I'll be working to transform in to a new TWM as soon as I can. Stay tuned for that "Part II" update. Until then, enjoy the resources below from my sessions and then watch for more updates as "Fall Travel Season" wears on. Next-stop: Q3 2009 release week! Did you miss last week's RadGrid for ASP.NET AJAX optimization webinar? Then don't miss this recorded video. This session covers the basics of optimizing RadGrid for ASP.NET AJAX and introduces a handful of techniques you can use to make your ASP.NET pages with RadGrids faster. Catch the video above and grab the session slides and demo code below. Enjoy! The fall travel season is swinging in to full gear and already blog posts are getting behind (which reminds me, I need to create a post about the "fall travel season"...). Kicking-off the season of conference travel was last weekend's trip to Fort Myers, Florida for the SW Florida Code Camp. A full-day Saturday event held on the campus of Florida Gulf Coast University, the 2nd Annual SWFLCC brought out almost 150 people to engage in .NET learning. This was my first trip to the SWFLCC and it was a great time! I presented 3.5 sessions- 3 scheduled + 1 "pinch hit" for a speaker that had a family emergency. My sessions were packed to capacity, and aside from some slow morning grogginess during my 8:30 AM slot, the audiences were very involved with great questions. To everyone that attended my sessions, a big thanks for coming out and being involved! Hope you learned something. For sessions, I covered a lot of ground, with topics ranging from Silverlight to MVC to Dynamic Data. You can grab all of the slides from this even below along with relevant demo code. Enjoy the resources and stay tuned for an updated list of my conference stops this fall. P.S. Big congrats to John Dunagan for playing such a big role in the success of this year's event! John is doing a great job unifying the .NET community in SW Florida, and with a little encouragement, I think he could expand SWFLCC to 300 people next year. Easily.